There’s so much to do in Kilkenny City, that often our beauty County is overlooked by visitors. But, there is much to be gained by stepping beyond the City boundaries and exploring the towns and villages around the County. 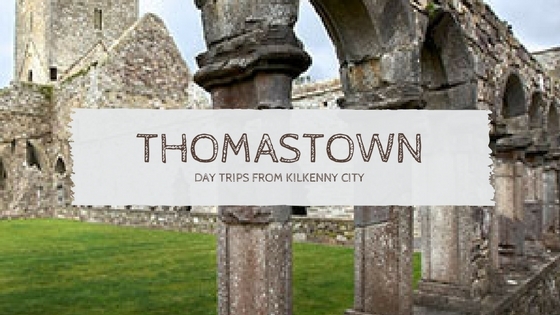 So, in a bid to give you the inside track on the must-see places and the hidden gems around Kilkenny county, we’ll be writing a ‘Day Trips from Kilkenny City’ series of blog posts – starting with one of my personal favourites, Thomastown. 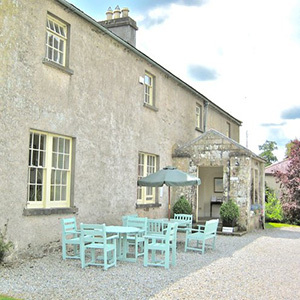 Thomastown is located just a 20 minute drive from Kilkenny City and is set in beautiful surroundings in the Nore Valley. 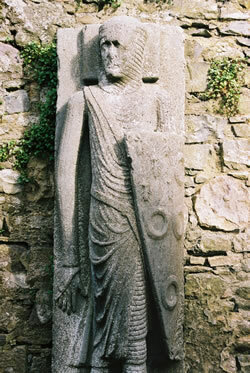 The town was founded in the 13th century on an important crossing point by an Anglo-Norman mercenary from Wales, Thomas FitzAnthony. He is credited with building a wall, complete with 14 towers around the town and in it a religious house and a castle in the 13th century. The castle was destroyed by Cromwell in 1650., but the ruins still stands today. 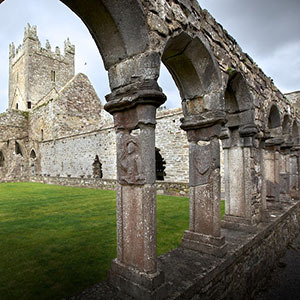 Visit the monastic ruins at the 12th centruy Cistercian Abbey. The church with its Romanesque details dates from this period. In the transept chapels the visitor can see 13th to 16th century tomb sculpture. The tower and cloister date from the 15th century. The chief delight of the Abbey is the sculptured cloister arcade with unique carvings. The 13th century church of Kilfane, now lies in ruins. But its remains are well worth exploring. It has an adjoining castellated presbytery and bell tower and there are traces of the original consecration crosses to be seen. Three original doorways in the north and south walls are headed by ogee stones. Remains of an altar, piscina, book rest and multiple recesses all grace the interior walls. A 13th century sedilia near the altar is believed to have come from an earlier church at the site and still has traces of medieval paint. A visit the unique Jerpoint Park is a must during any visit to Thomastown. Take a guided tour of the footprints of a deserted 12th Century Medieval town dating back to 1200AD. Your local guide will delve into the history and importance of this once thriving town called Newtown Jerpoint. Then, step back in time and explore the standing remains of St. Nicholas’s Church, the domestic tower and the stunning 14th Century Medieval Tomb. Jerpoint Park also offers Angling for wild Salmon and wild brown trout or why not try something completely unique and come watch our Sheep Dog demonstration, showcasing man and dog working together as one. 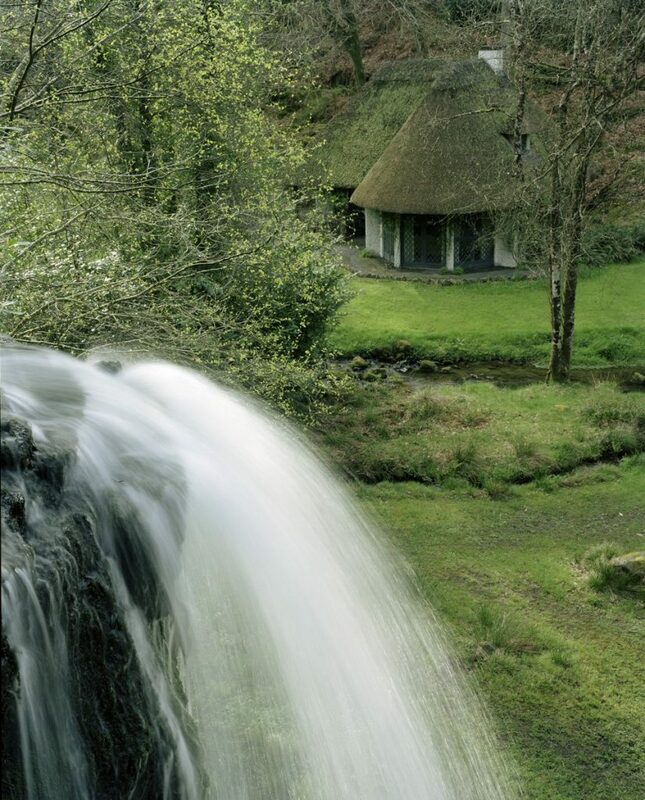 One of the County’s hidden gems is Kilfane Glen and Waterfall – a pristine example of a romantic era garden dating from the 1790s. Untouched for 200 years, it is a picturesque paradise with a waterfall tumbling its way to a rushing stream and woodland paths leading to a cottage orné. Tiny bridges sit among ancient trees, wild fox-gloves, ferns and other historically correct 18th century planting. The garden is listed as an Irish Heritage garden and was awarded assistance in 1993 by the European Union Cultural Commission. As an amenity it covers about 15 acres of easily accessible natural landscape. 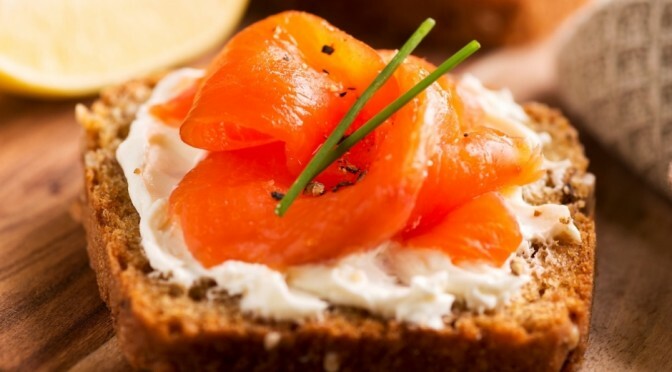 Have you heard of Kilkenny’s very own caviar? Goatsbridge Trout Farm organises farm tours where visitors can learn about our traditional trout farming system, the art of smoking and processing, as well as the family history and the heritage behind our company. Open Monday – Saturday, visitors are also welcome to drop into our visitor center without booking. 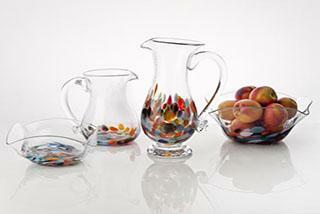 You will love their distinctive designs and won’t be able to help but make a little purchase when you’re there. Karen Morgan creates and designs a unique range of elegantly crafted table and decorative ware in Porcelain. Karen’s stylish porcelain range is skilfully hand thrown on the potters wheel. Located on Market Street in Thomastown, Karen’s studio and gift shop are well worth a visit to see her creations and view the work being handmade in the adjoining studio. Clay Creations ceramic studio and Gallery by Brid Lyons offers a wide variety of contemporary ceramic pieces, original designs and sculptural work. Brid’s sculptural works are creative in form with vibrant glazes creating a unique character for each piece. A visit is a must for every ceramic enthusiast. Jackie Hoyne’s iconic Blackberry Café is housed in a historic, award winning building that was once a cobblers in the heart of Thomastown. 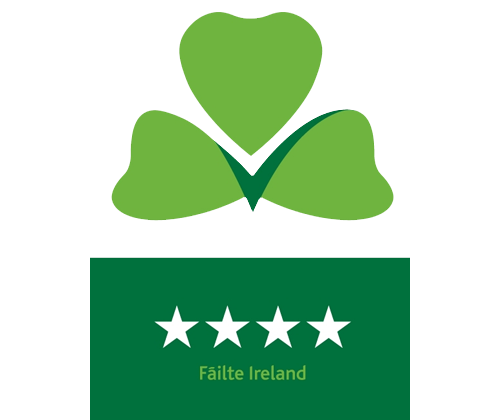 Dedicated to local food produce, it serves quality foods using local suppliers, such as Knockdrinna Farmhouse Cheese and pork products, locally grown organic fruit and vegetables and employs traditional recipes. Fresh baked cakes, tarts and scones with Blackberry Café’s own jam are favourites and the café has attracted a loyal following for its coffee alone. A take away service is available. 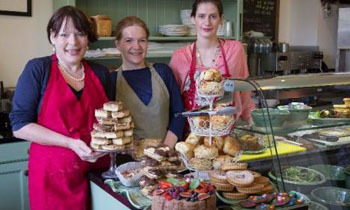 As your enjoy a visit to Jerpoint Park, take some time to enjoy the country house settings of theTea Rooms. Offering daily fresh scones made from an old family recipe, baked in the AGA cooker for the unique flavour and texture accompanied by homemade jams and cream. Teas, coffee & locally produced apple juice are served to guests. 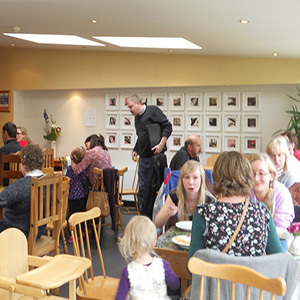 Part of the Camphill Communities of Ireland, The Watergarden offers a Coffee Shop, Gallery, Crafts, Garden Centre and Streamside. The beautiful garden offers a therapeutic backdrop to the workplace of The Watergarden and gives everyone an experience of the changing seasons which are open to the public all year round. Open Tuesday to Friday.